ReaSoft Network Drive is a valuable software for those who access network drives in a computer network, ranging from small home networks to medium-sized corporate networks. 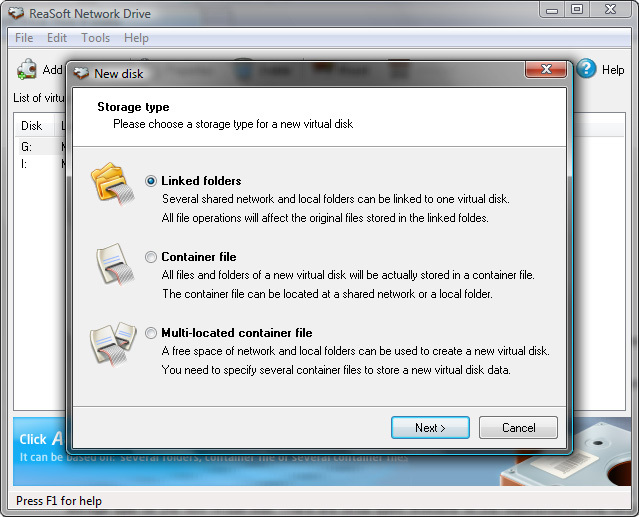 From now onwards, you can easily connect one or several local folders to the network drive. Installing ReaSoft Network Drive is a very simple and quickly process. The Setup Wizard takes you through a few steps where all you need to do is to get familiar with our licence agreement and select the folder where to install the drive. When the setup is over, you can choose whether to launch ReaSoft Network Drive right away or some time later. This can be any time, as the icon locates in the Start menu. After installation is complete, you should configure ReaSoft Network Drive. Container file: you should specify the full path to the random non-existent file to create the storage for the new drive. Encryption and compression is available for this type. Multi-located container file: Specify the path to some random non-existent files to create a large container for the drive. The difference between container file and multi-located file is that multi-located container file is physically divided into subfiles which can be located in different local or network folder. To map them manually use the "Mount" button on the toolbar. Automatic connection is possible only in case the option "Connect at Windows startup" is activated in the settings. If necessary, the drive settings may be changes by using "Properties" function on the toolbar. NOTE: ReaSoft Network Drive automatically loads when user logins. The disks are functioning only when the program is active.